Just 20 kilometres from Tarbes Ossun Lourdes Airport, this excellent family-friendly hotel offers spectacular views of the Pyrenees and a favourable location on the bank of the river Gave. The entrance to the popular Sanctuary of Lourders is just 400 metres from the premises, and the nearest bus stop is just a 5-minute walk away. The elegant guestrooms seem to bring the beautiful outside environment and nature in – stylistically, with the light pastel colours and natural materials, and quite literally – as they offer magnificent views of the imposing Pyrenees Mountains and the Pic du Jer summit with the iconic cross on top. With a stay at Hôtel Alliance Lourdes, you'll be centrally located in Lourdes, within a 5-minute drive of Rosary Basilica and Grotte of Massabielle. 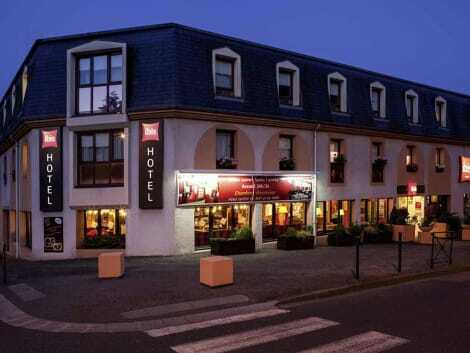 This hotel is 0.3 mi (0.4 km) from Le Petit Lourdes and 0.4 mi (0.7 km) from Lourdes Wax Museum. At Hotel Stella, enjoy a satisfying meal at the restaurant. Quench your thirst with your favorite drink at the bar/lounge. A complimentary buffet breakfast is included. At the heart of the pilgrim town and close to the SNCF train station, the team at the 3-star ibis Lourdes Centre Gare hotel will be delighted to welcome you to the heart of the catholic pilgrim destination made famous by the apparitions of 1858. 10 minute s from the Sanctuary and Grotto de Massabielle, close to the historic district, the Château Fort and the Pic du Jer with its funicular 0.6 miles (1 km) away. Whether for business or leisure, receive a warm welcome at your ibis hotel all year round.